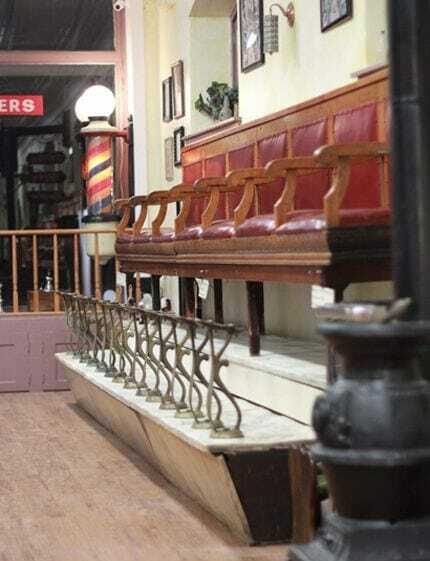 Trevor Reed and our antique shoe shine bench were meant to be. 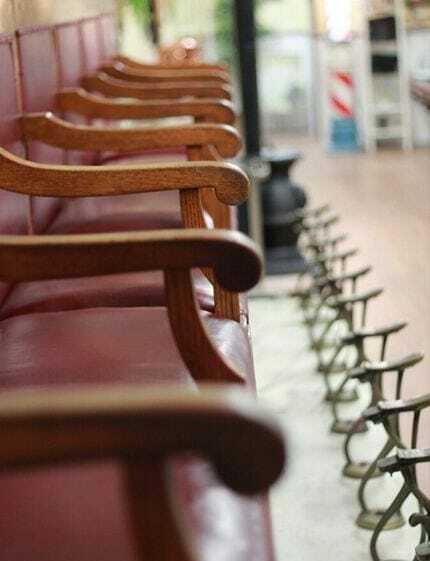 The owner of Reed’s Barber Shop and Shave Parlor took one look at its red seats and marble base and knew it would be a fit for his space in Green Lane, P.A. He’ll soon spiff up shoes with saddle soap and sole dressing in the traditional way. Reed gained an appreciation for age-old treasures early in life as he tagged along on his grandfather’s flea market missions. Flashlights in hand, they searched for pre-Prohibition beer memorabilia in the wee hours of the morning. He’s set the stage with nostalgic touches that he’s collected over the years like hot towel warmers, shaving mugs, and a cash register that clangs open after every sale. Customers line up for cuts that evoke old-school heartthrobs like James Dean while Motown and Sinatra play on the radio. Those up for the deluxe experience settle back for hot shaves. And for the littlest gents? A mini barber chair replete with leather straps that deter wiggling. Even the building that the shop is in has serious history. Once a jailhouse, Reed’s great-great grandmother was detained in a cell below the barber shop for brandishing a pitchfork at an unfortunate victim. Not to worry – we promise Reed has a gentler touch. For more info, go to reedsbarberandshave.com.